Полярный кодекс (Polar Code) — один из важнейших документов, разработанных Международной морской организацией (IMO) в последнее время. Особенное внимание в настоящей публикации обращает на себя специально подготовленная инфографика, наглядно показывающая преимущества Полярного кодекса для обеспечения безопасности судов, эксплуатирующихся в полярных водах. Значительную роль Полярный кодекс будет играть и в вопросах обеспечения экологической безопасности. Его нормы распространяются как на воды Арктики, так и Антарктики. По убеждению клубов взаимного страхования, императивные правила, которые содержатся в этих правовых нормах, будут весьма интересными для лиц, осуществляющих торговые операции в полярных водах. a. The North East Passage which follows the Russian and Norwegian coasts. The Northern Sea Route which trails the Russian coast from the Bering Strait to the East, to the Kara Sea to the West.These two routes overlap and hence the terms are sometimes used interchangeably. c. The Arctic Bridge is an internal Arctic route linking Russia to Canada.This is a seasonal sea route linking the Russian port of Murmansk to the Hudson Bay port of Churchill, Manitoba. It is a useful link in the export of grain from the Canadian Prairies to European markets. 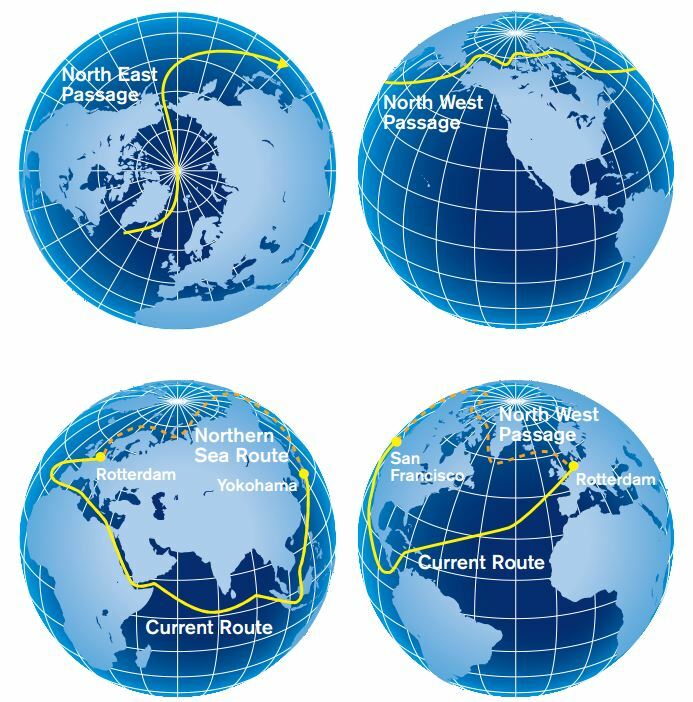 d. The Transpolar Sea Route crosses the Arctic through the North Pole. In contrast to the North East Passage / Northern Sea Route and the North West Passage, this route largely avoids the territorial waters of Arctic states and lies in international high seas.Whilst it is currently only navigable by heavy icebreakers, it is expected to become the most important Arctic shipping route in the future because it is the shortest route between Europe and Asia at only 3,900 kms. The increase in traffic to the arctic where conditions are harsh and remote has led to a consensus at the United Nations International Maritime Organisation that shipping to these regions needed to be regulated. A mandatory code for all ships operating in polar waters known as the International Code of Safety for Ships Operating in Polar Waters (‘Polar Code’) was therefore introduced through amendments to the IMO Safety of Life at Sea Convention (SOLAS) and the IMO Convention for the Prevention of Pollution from Ships (MARPOL).This Code reflects the concerns of the shipping industry regarding the sensitivity of the ecosystems in the Arctic and the Antarctic, and therefore, the need for a higher degree of care when navigating polar waters. The Polar Code and SOLAS amendments were adopted during the 94th session of IMO’s Maritime Safety Committee (MSC), in November 2014 and the environmental provisions and MARPOL amendments were adopted during the 68th session of the Marine Environment Protection Committee (MEPC) in May 2015. The code is mandatory and comprises of detailed requirements relating to safety, design, construction, operations, training and the prevention of environmental pollution.The Code applies to all shipping and maritime operations apart from fishing ships, ships under 500 tonnes and fixed structures.The main sections of the code are summarised as follows. Category C ship: Ship designed to operate in open water or in ice conditions less severe than those included in Categories A and B. In order for a ship to be issued with a certificate, an assessment is required. The assessment takes into account the anticipated range of operating conditions and hazards the ship may encounter in the polar waters, information on identified operational limitations, plans/procedures and additional equipment necessary to mitigate incidents with potential safety or environmental consequences. It must be noted, however, that the classification of ships under the Code does not link the ice-classes of ships with the actual ice conditions prevailing in the polar regions. 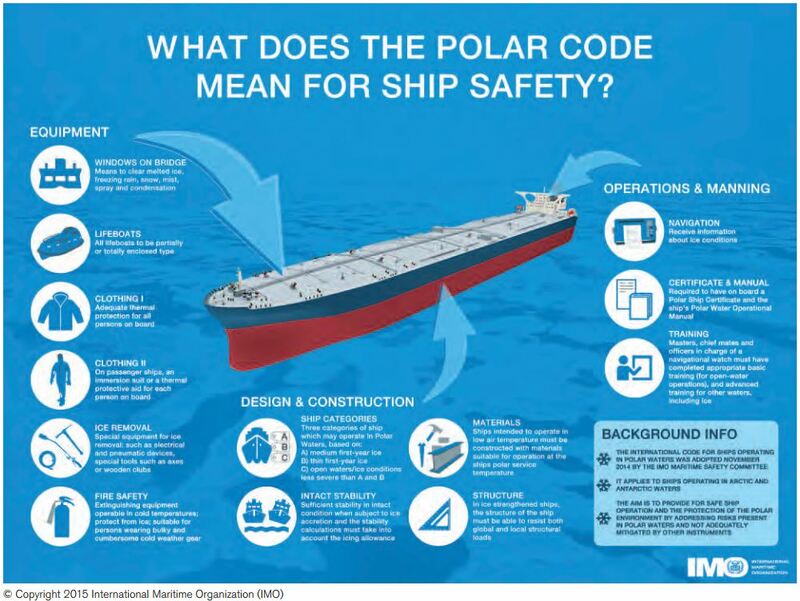 The industry has, however, developed its own standards such as Polaris (The Polar Operational Limit Assessment Risk Indexing System) for interpreting the various ice-class and polar-class regimes and the level of risks associated with ships of certain notations being used in certain ice types. All ships also have to carry the Polar Water Operational Manual, which sets out operating procedures and emergency response procedures. b) Ship structure and machinery installations The Code imposes requirements relating to stability, ship design ensuring watertight integrity and ability of machinery and ice removal equipment onboard to function in the extreme conditions of the polar regions. c) Fire / safety protection and life-saving appliances and arrangements The fire safety system onboard must take into account the need to facilitate safe evacuation and survival in these extreme conditions. For example, fire fighting equipment must be protected from ice and snow, adequate thermal protection must be available for each person and all lifeboats must be partially or totally enclosed. d) Safety of navigation, communication and voyage planning Ships are obligated to have a means of receiving and displaying current information on ice conditions in the area of operation and to have the ability to visually detect ice while operating in darkness.It is also necessary for ships to be able to prevent the accumulation of ice on navigation and communication antennas. When planning a voyage through polar waters, the Master must take into account the Polar Operational Manual, current information on ice and icebergs in the vicinity of the intended route, statistical information including temperatures from previous years’ information and measures to be taken when marine mammals are encountered relating to known areas with densities of marine mammals (including seasonal migration areas). e) Manning and training The Code requires companies to ensure that Masters, Chief Mates and Officers in charge of a navigational watch on board ships operating in polar waters have completed appropriate training, for example the Master should have at least 15 days experience under ice conditions.The extent of training depends on the ice conditions and whether the ship is a tanker, passenger ship, or other type of ship. Each crew member must be familiar with the provisions in the Polar Water Operation Manual relevant to his assigned duties and crew size must be sufficient to allow for a three-shift watch. The discharge of oil/oily mixtures from any ship into Arctic waters is prohibited by the Code.This includes any noxious liquid substances or any mixture containing such substances as well as sewage and garbage unless discharged in accordance with MARPOL Annex IV andV. However, this prohibition does not apply to clean or segregated ballast. The Code also requires that oil fuel tanks of Category A and Category B ships be separated from the outer hull. The Polar Code brings with it numerous requirements and necessities for all ships trading in the polar regions and therefore a great deal of investment will need to be made by operators in this region. It is without doubt that these requirements are necessary, especially given that the standard SOLAS ships are generally considered only to be adequate in open water conditions, where ice coverage is less than 10% and the average lowest daily air temperature is not lower than minus 10 degrees. Polar waters includes both Arctic and Antarctic waters. 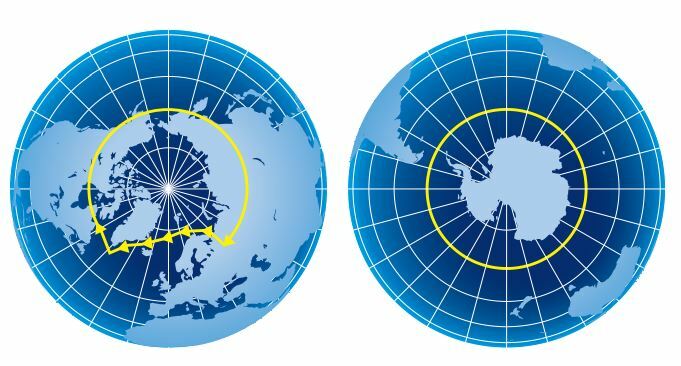 Below are the current geographical boundaries of the Arctic and the Antarctic (as set out in the Polar Guidelines). Whilst the Code applies to both polar regions, it also recognises that different measures may be appropriate for the Arctic and the Antarctic.The Arctic is an ocean surrounded by continents while the Antarctic is a continent surrounded by an ocean.The Arctic has been home to communities of native peoples who have made their living from the environment for thousands of years. Consideration has to be given to risks posed by shipping to these local communities. The Antarctic has no permanent population of people and is seen as an unspoiled, pristine environment with a low human footprint. Under the MARPOL amendments, the Antarctic has been made a zero discharge zone. Conclusion There is strong support for polar shipping as it is viewed as a historic milestone in the marine industry.Whilst concerns have been expressed, particularly by the environmental groups, that the Code does not go far enough to protect the polar regions from pollution risks and does not afford sufficient protection for its wildlife, the IMO’s adoption of the Polar Code is nevertheless to be welcomed. The Code has introduced international standards on matters such as ship design, anti-pollution regimes, crew training and safety.This will foster international research and exchanges to further improve the design and construction of ships and equipment, operational, training, search and rescue procedures, and work on environmental protection of the polar regions. The UK P&I Club will monitor the ratification of the Code’s progress through to entry into force.The International Environmental Compliance page on the Club’s website may therefore be a practical starting point for Members who wish to trade to the poles.